Aside from being the closest we’ll get to seeing a Shenmue 3 in this lifetime (given its high-level simulation of forklift physics), United Independent Entertainment’s Warehouse and Logistics Simulator is best known for its realism and faithful recreation of mundane labor. Similar to PC games like Farming Simulator and Train Simulator, Warehouse and Logistics Simulator challenges players to complete an honest day’s work while focusing on safety and efficiency. Forget all of that, though. This week sees the release of Hell’s Warehouse, a horror-themed add-on that fills the game’s harbors, distribution centers, and construction sites with bloodthirsty zombies. 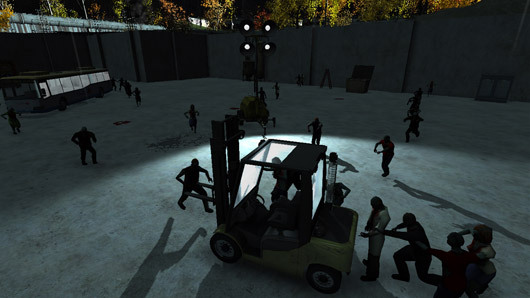 Luckily, players find themselves behind the wheel of a rugged forklift, which is more than capable of mowing down the undead hordes. Bombs, mines, and other weapons will also help to clear out particularly stubborn zombies across multiple scenarios and gameplay modes. Hell’s Warehouse is available at a 20 percent discount during its first week of release.